Marvel Guardian of the Galaxy: The Universal Weapon is a gesture based action game. The main game play functionality is to swipe characters to move, swipe from character to character to attack a target, and tap unique skill icons to perform special combat moves. The main goal of the game is to travel through the galaxy, build up your team of heroes, fight mysterious villains and recover the pieces of the Universal Weapon. The moving mechanic is a simple tap on a character and swipe to move from one location to another. While dragging from the selected hero, a blue line will drawn to show the path of movement. Be careful, various environmental hazards could cause damage if a character moves along a line passing through the hazards. There are three main types of characters: ranged fighters, close range melee fighters, and healers. All character types require the same gesture to initiate an attack or heal an ally. The gesture is as simple as swiping from the hero initiating the attack/heal to the targeted enemy or ally. Once a character has locked on a started attacking or healing an enemy or ally, that character will continue without additional swiping. This is an important strategy to get your entire team performing an action allowing the ability to make other game play actions. There are two classifications of skills, passive and active. Passive skills will increase attack and defensive stats but are not controlled actions. 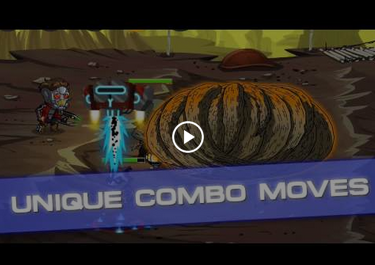 Active skills perform special powerup moves during the combats and require tapping actions to activate. During combat, when tapping on a character that character will become highlighted and will display his/her special skill icons in the top left corner of the screen. Activating special skills is as simple as selecting a target and then tapping on the skill icon to deploy the powerup move. Special skills have cool down periods and take some time to recharge before they can be used again. When skill trees have branching paths, a decision needs to be made to activate one of the two skills at that level in the skill tree. Each level of the game has three mastery tokens that can be earned by replaying the levels and increasing the master. The first token is earned after winning the level for the first time. The second and third tokens will require multiple wins before they are earned. Guardians Mastery Tokens are very important to the overall game play. When a mastery has been reached, Command Points will be awarded. Also, specific levels of masteries are required for recruiting special bosses that can be used in arena play. Through completing Missions and progressing through the story, new heroes will be unlocked who can be leveled up and upgraded and can be added to the team for combat; in Missions and in Arena Play. Throughout the game the heroes will face off against a rich variety of boss with unique skills and abilities. Once defeating some bosses, they become unlocked and available to recruit for Arena Play. Each character has a unique weapon that can be earned by completing special Quests. Once unlocked and equipped, the weapon can be upgraded as the characters reach new level up plateaus. A pulse event occurred causing Isotope-8 to be strewn throughout the galaxy. Isotope-8 is a very important power sources that when equipped on a character can boost that character's defensive and offensive capabilities. An important goal is to search out new Isotope-8 gems as they cannot be purchased. There are four types of Isotope-8 and seven degrees of color for each type. Higher levels of the same color and fusing together to create a more powerful type of the same color.